As if the Degrassi kids haven't been through enough romance drama, there's even more in store just in time for Valentine's Day! In the one-hour special "Love Games," charmer Declan is chasing after hard-to-get Holly J., while there's a crush triangle going on between Leia, Chantay, and Danny! "Love Games" premieres on Friday, February 5, at 9 p.m. 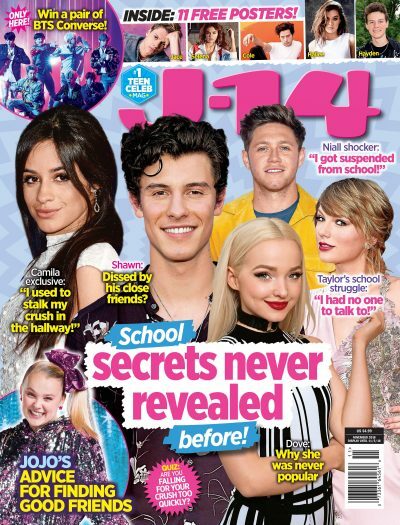 ET on TeenNick, and J-14 got the inside scoop about the ep straight from Degrassi stars Charlotte Arnold and Landon Liboiron. J-14: What is your fave part of the "Love Games" special? Charlotte Arnold: "Love Games" was such a fun two-parter to film! I really love one scene where Declan locks Holly J. in a sound booth and they have a conversation through the door. Since they both have such stubborn personalities, this is the first time Holly is forced to actually hear him out, and she realizes there may be some sparks there. We split the scene over two days of filming, which is unusual, but I think it worked! Landon Liboiron: I really enjoyed exploring a new side of Declan. At the beginning of the season he was this cocky player. But finding a desperation in Declan [in "Love Games"] — that need for love — and to see exactly what he would do to fight for love was fun. J-14: What will Degrassi fans really appreciate in the new two-parter? Charlotte: Degrassi fans will really get a kick out of seeing these two characters fall for each other! There are a ton of really funny, romantic moments, and I think the great time we had filming it really shows in the episodes. There's plenty of awkward moments to enjoy, from trying on insane vintage sunglasses, to attempting to kiss with pizza in our mouths, to witnessing Landon get smothered by toddlers and spill pasta on his lap repeatedly! Landon: It's full of romance and laughs, ups and downs, and you'll get to see these two great characters fight for what they love in each other. J-14: Have you ever experienced a feeling like Declan's love for Holly J. in real life? Landon: Who hasn't had this type of feeling in high school? Declan definitely has better resources at hand to woo a girl [than I did].